Kingdom Life Church is a church where you will experience the presence of God. We are a family unified in spirit and held together by peace. We place no religious expectations of people. We foster an environment where you can draw closer to God. Our heart is to have a true “five-fold ministry” where apostles and prophets lead and evangelists, pastors, and teachers encourage shepherd and disciple. The ministry does not depend on one person. The gifts of the Spirit are given to each for the profit of all. We truly ask God every time we get together, “What do You want to do?” Then, we let Him lead. 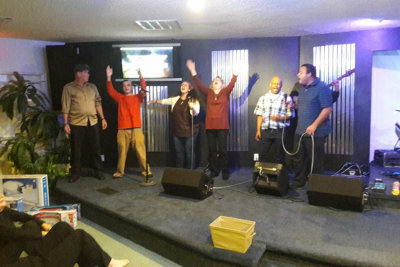 Kingdom Life Church of Florida (2004 to present) is the combination of America’s Church (2002-2007) of Largo, Freedom Family Fellowship (2005-2006) of Clearwater, Believer’s Way Church (2005-2008) of Clearwater, and Christian Revival Church (2004-2010) of Tampa Bay. Each of these churches was founded and led by men full of faith and the Holy Spirit, but the LORD called them out of the area. Clay Runnels, the common thread linking these ministries, was called to lead each of these ministries. Eventually, they came together with the name of Kingdom Life Church to reflect the vision and purpose of God for the ministry moving forward. In 2012, God paired Mark Gantner and his family with Kingdom Life Church. Together with many other amazing leaders empowered by the Holy Spirit, the people of Kingdom Life Church are experiencing open heavens and amazing encounters with Jesus Christ. 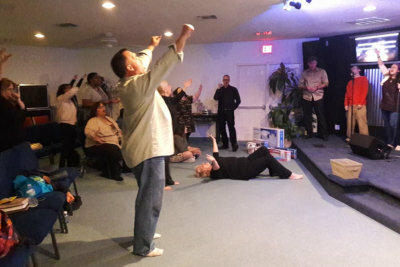 Kingdom Life Church is an apostolic training center with a mission to transform the region, reflect the Kingdom of God in the earth, and to raise up men and women fulfilling their purpose in life through Christ. Because of our commitment to allowing the Holy Spirit to lead and our diverse leadership, you can count on each service being different from the last. But they are all full of worship, the Word, the presence and power of God, and His glory. Clay Runnels and Jessica have been married for almost 30 years and have five children – two of whom have graduated from CFNI and are married serving Jesus. One is about to graduate CFNI and two are still at home. Clay spent 18 years bi-vocational as a bank employee and pastor until he went full time in the ministry in late 2012. Jessica home-schooled all of their kids and is an amazing children’s ministry leader at Kingdom Life Church. Mark Gantner has been married to his wife, Jenn, for about ten years and they have three children. Mark and Jenn both traveled extensively in separate ministries before meeting each other, falling in love, and starting a family. They started a home church in 2012 and then merged their ministry with Kingdom Life Church in early 2013. For any of your inquiries, please feel free to reach us today.